Located in the heart of Pike Place Market, the Atrium Kitchen is a state-of-the-art commercial kitchen. Designed to be a community resource, the kitchen is available for rent by community groups, individuals, chefs and Market vendors. 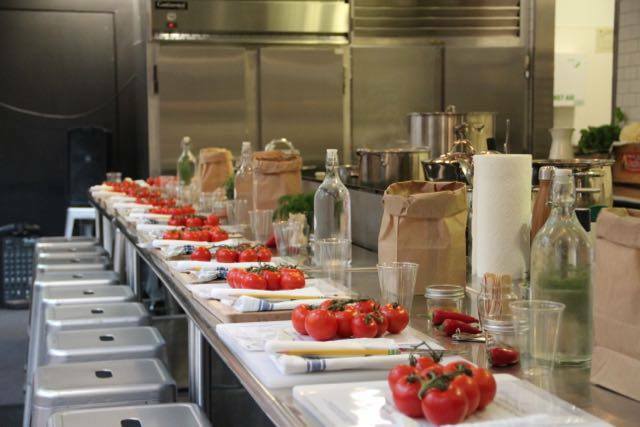 The Atrium Kitchen is also a food-business incubator, and we welcome blossoming chefs who are seeking to test out their concepts with Pop-Ups and cooking classes. The Atrium Kitchen is managed by Chef Traci Calderon of Succulent Catering & Events. The vision is to continue the Atrium Kitchen's legacy as a community resource for a variety of food-centric events from cooking classes to team building utilizing culinary concepts to private catered events. The Atrium Kitchen opened in December 2012 in the heart of Pike Place Market. Adjacent to the kitchen is the Atrium Floor which can accommodate 125 guests for corporate events, wedding receptions, private celebrations, Pop-Up dinners, book signings, and private music events. Thanks so much! We are beyond grateful for you and all that you taught us! You are amazing! The chefs of Succulent Catering & Events have been serving clients in the Pacific Northwest since 2009, and were the first chefs to cook out of the brand new Atrium Kitchen back when it opened in Decmber 2012. With a broad range of restaurant, catering, specialty food, private and personal chef service experiences, you are in capable hands when planning your next at the Atrium Kitchen. Thank you for a fun and informative morning! We enjoyed every minute."